"Matroids, graphs and vector spaces" Abstract. "Chern-Simons theory on 3-manifolds with boundary" Abstract. "Cobminatorics of fiber bundles with fiber an oriented circle" Abstract. "Expression of double Hurwitz numbers through Gauss type integrals" Abstract. "Plane curves and L-spaces" Abstract. "Expansion and bounded generation in linear groups" Abstract. January 3, 2014. V.Fock (Strasbourg-Moscow-Komarovo). "Discrete Dirac operator and integrable systems". Abstract. January 17, 2014. M.Karev (PDMI). "Gauss type integrals and Hurwitz numbers". Abstract. March 14, 2014. B.Brychkov (HSE). "On the number of ramified coverings of a sphere with ramification over fixed points". Abstract. April 11, 2014. Ivan Panin (PDMI). "On a conjecture of Colliot-The'l`ene concerning quadratic spaces". Abstract. September 12, 2014. A.L.Smirnov (PDMI). "Three-dimensional view on number theory". (Analogy between knots and prime numbers). 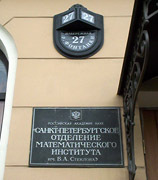 Place: Room 311, PDMI (27, Fontanka, St.-Petersburg). Cumulative list of talks, 2001--2014. This site was started on 09-Sep-2001. 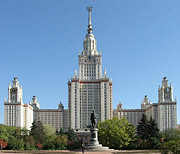 It is maintained by Sergei Duzhin.